Jerry Frissen's Lucha Libre comic series is already a line of collector's toys by Muttpop; but toymaker Bob Silva says it was almost a multiplayer game made by The Behemoth. In his blog, the Muttpop president waxes on the development process behind the Luchadores Five figures. Apparently, some of the early sketches were so inspirational to Silva and Frissen, they "decided we could e-mail bomb our favorite toy companies and a videogame company called Behemoth." Behemoth had just released ALIEN HOMINID for the Gamecube and Xbox. I really felt like the spirit of that game had something in common with what we were doing. I heard that the Behemoth guys were thinking of doing a multiplayer game so I was trying to convince them to do one with the Luchadores Five and Tequila. Both Tom Fulp and Dan Paladin got back to me via email. They really loved the designs I sent them (I sent the 2 'pitch' jpegs below and a few final pencils images of some of the other characters from Luchadores Five) and were going to talk to their investors about the possibility of collaboration. Obviously, it didn't work out. 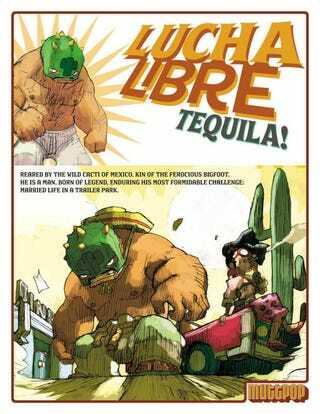 But I think I can see some similarities between the green Crasher and the Tequila sketch. Could it be the green luchadore mask?